Associations of universities and the deep internationalization agenda: beyond the status quo? Home > Associations of universities and the deep internationalization agenda: beyond the status quo? Do our associations of universities have the adequate capabilities, including infrastructures, to support the well-spring of 'internationalization' that is emerging in member universities in virtually all countries? On some levels yes, but on other levels perhaps not. One of the interesting aspects of the enhanced significance of internationalization in the higher education and research world is to reflect upon who takes up the agenda, and what do they really do with it. In a variety of contexts I've been hearing more and more dissatisfaction with the status quo regarding internationalization, which in most universities simply means more study abroad, more foreign students, more Memorandum of Understandings (MoUs). 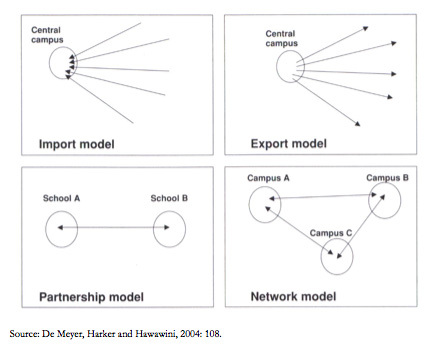 To be sure some universities have gone very far along these paths, but these are well worn paths, and arguably not reflective of the development and implementation of internationalization strategies that create new paths, new models, deep connections, and visible yet also successful 'signature' projects. They are also reflective of a centralization (import) logic , and an unease about unsettling existing ways of doing things (despite the assertive rhetoric). There are signs this situation is changing, though, with the development of branch campuses, the establishment of a range of international collaborative degrees (an issue I'll be writing about soon), regularized co-advising and co-teaching via the systemic provision of distance learning technology, the knitting together of institutional architectures via the creation of research units within other universities, and the like. Examples of these types of initiatives are thin on the ground for the most part, though. Scaling up, associations of universities in many countries have also been building up their internationalization agenda. Typical activities include lobbying relevant authorities about policy matters (everything from immigration and visa matters through to GATS), the coordination of capacity building programs and projects in other countries, and member university capacity building (usually via best practices sharing, fellowships, or secondments). Some associations also provide user-pay support services for members - a trend emerging in association with the 'cost-recovery' agenda. For example, the Association of Public and Land-Grant Universities  (APLU) in the United States works on this front via its Commission on International Programs  which has "four Standing Committees: 1) International Exchange 2) International Development 3) Academic Affairs and 4) Federal, State Private Sector Relations." Or take the case of the Midwestern Committee on Institutional Cooperation  (CIC) which convenes regular meetings of "Senior International Officers" (usually deans, directors, vice-provosts), while also acting as a conduit for relationship building between its member universities and individual universities (e.g., my colleagues from the University of Birmingham will be visiting this coming week) or groups of universities (e.g., Australia's Group of Eight ) from other countries. How is the global higher education landscape changing, and how might we be effected by it, or take advantage of aspects of it? How do we map out our university's international connections? How do we really internationalize - the process, the plan, the implementation, and the iterative process of update and revision? How to we effectively plan for risk? How do we frame, define, and establish governance pathways, for international collaborative degrees and internships? How do we create and support (financially, and administratively) overseas units that need some legal and physical presence? How do we establish and control costs, and ensure security, with respect to communications infrastructure? How do we negotiate with representatives of other systems that have very different understandings of the role of higher education and research in the development process, state of the art pedagogy, academic freedom, incentives and desirable outcomes, and quality assurance and accreditation? What should the key non-negotiables be? Should we, and if so how do we, engage with major transnational corporations like Thomson Reuters and Google? What should we demand, and expect, of our new partners? Where do we get quick and effective legal advice (most university legal affairs offices lack internationally experienced staff)? How might our strategies contribute to emerging tendencies of exclusion and/or inclusion with respect to the production, circulation and consumption of knowledge? Clearly some universities have this all worked out, but they tend to be the well-resourced and capable ones like Yale or NYU. The majority of universities in the Global North and the Global South are grappling with many of these issues, and many more, yet they tend to operate on (as makes sense in many ways) an institutional and bilateral level; reaching out, making connections, formalizing relations, and engaging. They are inventing anew and while this is logical it is highly inefficient and not always risk-free given the differential capabilities of universities that are partnering up, but also the differential capabilities between universities and new players (including foreign governments and the state more generally). Associations of universities are obvious candidates to build up the capacity of their members but they too are seeing enhanced obligations and mission creep as the denationalization process unfolds. Such associations are also grappling with fiscal constraints for they tend to reply upon membership fees as a main if not majority source of revenue. Thus there is an emerging disjuncture - universities have more on their plate, while associations have more on their plate, but the membership fee revenue foundation has intractable constraints and structural contradictions associated with it. 'Living' (ie virtual) manuals to guide all aspects of establishing international partnerships (one model is the Internationalisation of European Higher Education – A New handbook , jointly edited by the European University Association and the Academic Cooperation Association). Virtual manuals could include model as well as sample MoUs and legal agreements for these are rarely shared, as well as relevant geovisualizations that map out the terrain and nature of relations between universities around the world. Retainers for on-demand services with select law firms to assist in shaping select aspects of the internationalization process, including in the late stages of negotiations and agreement drafting. Aspects of this assistance could be knitted into the virtual manuals idea noted above where reports (e.g., see International partnerships: a legal guide for universities ) are available for review. Risk assessment review manuals, with templates for both process and final reports. As my colleague Ann Hill Duin (Associate VP/Associate CIO, Office of Information Technology, University of Minnesota) put it to me at last week's APLU conference (where I was speaking ), why should universities establish their own IT systems in global higher education hubs when they could collaborate much more closely and reduce costs? Or why should universities from one country work on an individual basis to establish foreign presence via leased space in select city-regions when they could collaborate, via an associational or inter-associational relations, and build a purpose built structure. Imagine, for example, a structure modeled on the wonderful Alliance Française de Singapour  building (pictured twice in this entry) in Mumbai or Beijing or Shanghai or New York or Boston or Paris or Abu Dhabi or Lagos. It could include a small hotel, cinema, lecture space, marketing space, meeting space, a range of video conferencing technologies, etc. It could be of much use to member universities, and could also be leased out to local institutions, or other non-member institutions. One could imply I am recommending a foreign compound but this is not at all what I am suggesting; rather, this would be a space of transaction, a space to enable faster, quicker, more efficient and more conducive networks relations, and in an aesthetically pleasing environment that is less open to the vagaries of market fluctuations in leasing prices. It would also send a tangible and visible message of commitment to host nations/cities. In any case, this is but one of many ways we have yet to many of our associations of universities move forward individually, in partnership with other same-country associations, or else in partnership with organizations like the International Association of Universities  (IAU). But these types of initiative cannot be just layered on for it they are dependent upon new streams of direct and in-kind resources from government agencies, alumni, philanthropists, member universities, and so on. New models are needed or else we have to accept a status quo that defacto penalizes universities with fewer internal resources. In closing, I'd like to flag one forthcoming opportunity to discuss the issue of how associations of universities can better navigate the emerging global higher education and research landscape. The International Association of Universities  (IAU) is organizing the fourth IAU Global Meeting of Associations (GMA IV) in New Delhi, India, 11-12 April 2011. This particular meeting is being organized in partnership with the Association of Indian Universities  (AIU) and the Indian Institute of Information Technology  (IIIT). The purpose of the Global Meeting of Associations is to bring together associations of universities (not individual universities) and grapple with challenging issues facing associations and their member universities. This year's theme is the Internationalization of Higher Education: New Players, New Approaches. I'll paste in the background information flyer to the left (it expands if you click on it), and you can register here , download background information  here, and download the preliminary programme  here. Further details are available via [email protected]  or [email protected] . I participated in the 2009 meeting in Mexico and was truly impressed by the richness of the discussions, and the opportunities that emerged for enhanced cooperation at a range of scales, and on a range of issues.